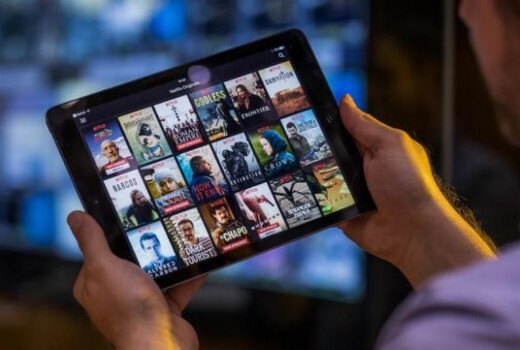 Nearly 14 million Australians now have access to some form of Pay TV / Subscription TV, up 11.8% on a year ago, according to Roy Morgan Research. Over 11.2 million Australians have a Netflix subscription, up by 25.2% on a year ago. Stan is the leading Australian-owned SVOD with over 2.6 million Australians -up an impressive 45.2% on a year ago. The largest increase was for Amazon Prime Video which more than doubled its user base over the last year by 116.7% to over 570,000. Kayo Sports already reaches over 150,000 Australians. Free trials are great…except when the service doesn’t deliver. I tried Netflix for free… stopped… then returned. I tried YouTube Premium for free… stopped… but would consider returning. I tried Stan for free…. and I didn’t even make it to the end of the 30 days. Yes, content was fantastic, but the software was so glitchy for me it made it unwatchable. I’d consider returning to see if things had improved, but it would likely end up being at the expense of one of the other providers…. Guess the Netflix figures is a breach rather than unique subscribers as that would be every house in Australia. It used to be that all programming was available to all on the FTA channels. Then along came Pay TV (Galaxy/Optus TV/Foxtel), and people complained about not being able to watch all the programs they wanted to without paying, particularly sport when Foxtel started targeting sport such as AFL and F1 in recent years. Now, there are so many streaming options, each with their own signature programs, that the market is now just too fragmented for me to worry about the new kids on the block. How much would you have to pay per month to get access to all of these TV services? It’s simply ludicrous. The only one I might be interested in is Netflix – if it comes to Foxtel, which the PayTV news section on tvtonight reported as a possibility back on 17 Feb.
@condex: you are remembering the past through rose coloured glasses there. It really did not used to be that all programming as available to all on FTA at all. I remember delayed sports coverage, episodes shown out of order or not shown at all half way through a season, programming changes, having to set a VCR for the right time on the right channel (vs the internet where it’s on demand when you want), and various other issues. It is possible to go overseas on the internet, completely legally I might add, and get most of the content you find on foxtel for free or in the case of sport at a much cheaper rate (especially if you are only interested in one sport). Once you increase that to the 2-3 sports most people are interested in, it’s cheaper to get foxtel. Ah the old days were if the Cricket was played in your State you’d only get the morning session and first part of the one dayers. While over on Seven you’d get an AFL Game of the round (plus other games highlights), so if your team was in that recorded Game you’d try and avoid the scores until it was on (and sometimes that would be a condensed version of the match). Then there was a time when your local Teams weren’t on FTA live in your state as they thought it would cause low attendance at games and you’d only get interstate ones. That was around the time when people would try and get an illegal satellite box so they could view the channels around the country like Seven Central/Prime, Impaja and etc., so they could watch say the Games in Melbourne live (rather than Freo vs West Coast or whatever). I’m not. 1) for people who watch a lot of youtube, ad free youtube is a no brainer; and 2) it also comes with unlimited music thrown in on 2 services (google play music and youtube music); and 3) Neilson stats are that 14.6 million aussies watch an average of 21 hours of youtube per week. Most would just it for Google music streaming and the ad free YouTube. We have Stan and it has some great TV And Movies eg. Marvel and Disney. 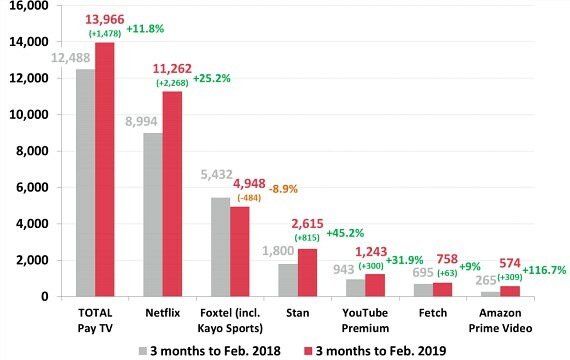 Yes, clubs, pubs, hotels and other outlets are good earners as they pay higher commercial rates, so franchise sports rights will likely be the primary reason Foxtel will manage to keep itself in business in the future especially as competing SVOD choices will multiply as each year passes. Stan cant afford to be idle either, after receiving a subscriber sugar hit from its Disney content what then, Stan needs to acquire its own GoT attractions a lot more regularly than they are now if it wants to keep increasing its subscriber numbers. Not if they lose their rights. Global streaming players have reportedly approached the AFL already about getting the rights in 2023. For pubs, clubs, addicted gamblers, sports journalists and others who can’t have it on a few seconds of delay, they’ll use satellite for the rest of us it will be internet streaming direct to your TV. Prime is the best value for money. Free amazon delivery which I have more than got my money back on plus a selection of now free movies and tv. It’s worth it just for between 2 ferns. I’m guessing 10 all access subscriber numbers are just a rounding errror. Yep I did the yearly fee on that at $54, so yeah $4:50 a month, is less than hiring a Movie on iTunes/Fetch/Google Play, plus as you say the other side benefits come into play, including also getting 1,000 e-books to read and Twitch TV (some shows are free to Prime Subscribers). So even if you only watch a couple of shows a week or one movie a month you still come out ahead and yeah Between Two Ferns is hilarious. Then you have The Man In The High Castle, American Gods, Home Coming, The Expanse, Jack Ryan, The Marvelous Mrs. Maisel, The Romanoffs and heaps more, plus to top it off they have all the seasons of my fave show ever Psych so I dip in and out of that. *Sorry is now $59 per year so $4.92 per month first 30 days free.